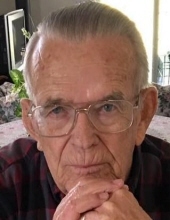 Roy, UT - Our father, grandfather, great-grandfather and brother, Clinton Lee Colby, age 87, died on February 5, 2019 at the George E. Wahlen Veterans Home in Ogden, Utah. We are certain there was a joyous reunion when he and his beloved wife, Dorene, were reunited. He was born June 20, 1931 in Richfield, Utah, the son of Clinton Eugene and Allie Casto Colby. He attended school in Richfield, as well as numerous other colleges and trade schools. Lee married Dorene Nielsen from Salina, Utah, on October 28, 1950, in Reno, Nevada. Lee missed her terribly after her death in 2010 and would have celebrated their 60th wedding anniversary a month after her passing. Lee retired from the US Army with over 20 years of service. He served as a senior NCO at the time of his retirement. He was a dedicated cold warrior and was attached to the Army Security Agency for most of his military career. This career allowed him and his family to travel the world: Japan, Korea, Austria, Germany, England, France, and several choice places in the United States. Lee retired a second time as a supervisor at the CAMDUS facility at Tooele Army Depot. Lee loved to hunt, trap, fish, tend to his garden and work as a camp host with his wife, Dorene, at various state parks. After his retirement, he and Dorene spent many winters in Yuma, Arizona. He is survived by his children: Morgan (Serina) Colby (Gig Harbor, WA), Kim (Kenny) Winters (Farr West, UT); his grandchildren: Colby (Renee Wilson) Bone (Washington, DC), Austin (Sunnie) Bone (South Weber, UT); his great-grandchildren: Dexter Fenstermaker (Ogden, UT), and Ruby Lee Bone (South Weber, UT). He is also survived by his brothers: Cloyd R. Colby (Laguna Hills, CA), Gene Chett (Carolyn) Colby (Killeen, TX), Rusty Colby (Richfield, UT); his sister, Micala (Deno Blau) Jensen (Providence, UT), and his sister-in-law, Julie Colby (North Salt Lake, UT). He is preceded in death by his beloved wife, Dorene Colby; his parents, Clinton Eugene Colby and Allie Colby; his son, Stacy Zane Colby; his brothers, Sjon K. (Julie) Colby, and Zane Colby. A future graveside service will be announced and held in the spring under the care of the Springer Turner Funeral Home of Richfield and Salina, Utah. Lee’s family would like to express their gratitude to the kind, attentive and professional staff at the George E. Whalen Veterans Home of Ogden, UT. Their compassion knew no limits, and for this we will forever be grateful. To send flowers or a remembrance gift to the family of Clinton Lee Colby, please visit our Tribute Store. "Email Address" would like to share the life celebration of Clinton Lee Colby. Click on the "link" to go to share a favorite memory or leave a condolence message for the family.